Results: 1 to 10 of a total of 2028 results. Does purpledragon8 belong in this group? Does jdarazs belong in this group? I am 49 years old. 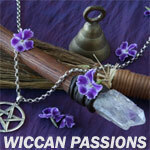 I have been a Wiccan before now coming back to the solitary practice. I am also in a relationship with a male who is not a Wiccan. He is in the b.d.s.m. lifestyle as I am. Looking to learn more about who and what I am. Does infinityrose belong in this group?